In the network economy, growing intellectual capital is the key to increasing market value. In Maximizing, Tornow, London, and their associates demonstrate the power of 360-degree feedback for developing managers, renewing organizations, and building learning cultures. Drawing on years of experience and state-of-the-art research, the authors have crafted a highly useful and practical book which provides us with a thorough understanding of this invaluable organizational tool. Despite the burgeoning popularity of 360-degree feedback for rating work performance, few people have a detailed understanding of how it can be used to enhance, even maximize, individual and organizational development. This standard-setting manual draws on the twenty-eight-year expertise the Center for Creative Leadership brings to the subject to give HR managers, consultants, and systems designers the big-picture guidance they need to determine if 360-degree feedback is right for their organization and, if so, to implement it. 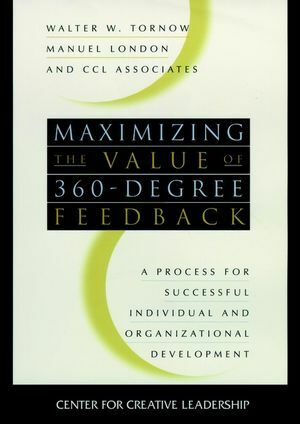 Readers will discover how they can use 360-degree feedback as a tool for achieving a variety of objectives such as communicating performance expectations, setting developmental goals, establishing a learning culture, and tracking the effects of organizational change. Comprehensive guidelines show how 360-degree feedback can be designed to maximize employee involvement, self-determination, and commitment. Includes case examples and a bevy of instructive instruments. WALTER W. TORNOW is a senior fellow and former vice president of research and publications at the Center for Creative Leadership in Greensboro, North Carolina. A licensed consulting psychologist and certified senior professional in human resources, he has published widely on such issues as performance management, service quality, assessment technologies, and 360-degree feedback. MANUEL LONDON is professor and director, Center for Labor/Management Studies at the Harriman School for Management and Policy at the State University of New York at Stony Brook. Also an adjunct research fellow at the Center for Creative Leadership, he is the author of five previous books with Jossey-Bass including Employees, Careers, and Job Creation (1995). MAXIMIZING THE VALUE OF 360-DEGREE FEEDBACK FOR INDIVIDUAL DEVELOPMENT. Elements of Effective 360-Degree Feedback (S. Brutus, et al.). 360 in Action: Following Catharine's Footsteps Through a Leadership Development Program (W. Sternbergh). MAXIMIZING THE VALUE OF 360-DEGREE FEEDBACK FOR ORGANIZATIONAL DEVELOPMENT. Best Practices: Five Rationales for Using 360-Degree Feedback Process (M. Dalton). Forces That Affect the 360-Degree Feedback Process (W. Tornow). The Competitive Advantage of Customer Involvement in 360-Degree Feedback (C. Paradise-Tornow). 360-Degree Feedback in the Establishment of Learning Cultures (P. Wilson, et al.). MAXIMIZING THE VALUE OF 360-DEGREE FEEDBACK THROUGH DESIGN, IMPLEMENTATION, AND MEASUREMENT. Designing 360-Degree Feedback to Enhance Involvement, Self- Determination, and Commitment (E. Van Velsor). Understanding Cultural Influences on the 360-Degree Feedback Process (J. Brittain Leslie & N. Gryskiewicz). Using 360-Degree Surveys to Assess Change (J. Martineau). Conclusion: Challenges and Implications for Maximizing 360-Degree Feedback (W. Tornow & M. London). Resources for Developing Leaders from the Center for Creative Leadership Look here for tools and resources for developing leaders, presented by Jossey-Bass and the Center for Creative Leadership.